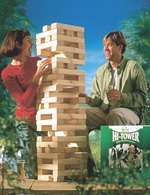 Giant Garden Games are an exciting way for families to spend some time together. These super-sized games come alive and bring a new meaning to fun. Great for use indoors on rainy or inclement days and outdoors during the summer months. A game of skill and cunning. Build the tower, then take it in turns to remove a piece and add it to the top without making the whole tower tumble. With 58 solid wooden blocks, each block is 10". Ages 8 and up. Strategy, skill and of course a lot of luck combine in this giant version of this well known game. Take turns to drop your counters into the frame to try to form a line of 4 and stop your opponent from doing the same. Only the steadiest of hands can succeed in this game of daring tension. Try to remove each stick in turn without moving any of the others. Rack up the highest score of the day to claim the winner's crown. Contains 30 wooden sticks 0.9m (3ft) in length. Ludo is fun for all ages. Giant Ludo can be played as a team game or as individuals using the giant foam playing counters. Form a block for other players by landing two members of your team on the same space. Send your opponents back to base by landing on the same space as them. Giant Ludo is a tactical game full of rivalry to get temperatures rising! Includes 3m square plastic playing mat, 8 pegs, 2 giant inflatable dice and 16 giant foam playing counters. There’s massive fun to be had with this giant party game for up to 30 players. Throw the two giant inflatable dice to find out which part of your body you have to place on which color flower. “Get knotted” up with the other players to make the game more difficult for them. But beware, fall over and you’re out of the game! Contains giant playing mat 10' X 10', 8 pegs and two giant inflatable dice. A perfect addition to Hoppin Mad and Hoppin Sacks, this game is fun for all ages. Comes with 3 play area marker cones, 1 movement dice and 1 action dice. Play as teams or individually, the object is to win the race by throwing the movement dice to see how many spaces you can move and the action dice to see which silly movement you must use. Giant Snakes & Ladders Garden Games takes the traditional game of Snakes and Ladders to a totally new dimension. This giant version puts you in the heart of the game, where you move up the ladders and down the snakes. We've also added some new features for extra fun! The set contains a giant playing mat 3m square (10ft square), 8 pegs and a giant inflatable die. Giant Chess and Draughts make a stunning garden feature and an absorbing pastime. They can be displayed as an ornament in your garden or a game can be left undisturbed during several days of play. These all weather pieces are made from durable plastic. Playing piece weights can be tailored to your personal need by adding water or sand to their bases. Giant Chess: Queen 64cm high (25ins), Pawn 43cm high (17ins). Heavy Duty Vinyl Mat 10' x 10' available separately. Giant Checkers is a time honoured game that anyone can play. The pieces are produced to the same high standards as Giant Chess and are "queened" with a central movement rod for ease of handling. They can also be left outdoors without concern for the weather. Giant Draughts: 25cm diameter (10ins). Heavy Duty Vinyl Mat 10' x 10' available separately. Fun for all ages. Wooden Giant Dominoes can be played indoors or out. Come packed in a wooden carry box with rope handle. Each domino measures 5.25" X 2.75". Bocce, best known in Italy, is one of the oldest of all lawn bowling games. It is now gaining popularity in the North America since it can be played by people of all ages and on a great variety of surfaces. Comes with carrying case. Blow Up Dice is 17". Small Foam Dice is 3 1/2" and the Large Foam Dice is 6". Make up your own lawn games using these fun dice.